Sensei Andre has changed the URL of his blog to http://www.andrebertel.blogspot.com/ I have also changed the link in the sidebar for easy access. Sensei Andre has also posted a comment on "Our master's voice" post. I hope the post is as well received from all its readers. If you haven't looked at Sensei Andre's blog before it is well worth a look, an essential read for all Asai karateka, you'll love it! I will do my best to relay to you the strong feelings of our Chief Instructor Kato Shihan with respect to hierarchy and etiquette in the IJKA. Kato Shihan has asked of our instructors why they rei to the young Japanese instructors as they enter the dojo and ignore their own senior instructors? Is it the colour of their skin? Senior instructors, why do you rei to these instructors, they are your kohai? They should rei to you, you are Sensei! Hierarchy is a significant part of Japanese culture. This structure is reflected everywhere in Japanese life. How hierarchy is formed depends mainly on seniority, social roles and gender. From high school age, older ones are called "Sempai" (meaning senior person) and younger ones are called "Kohai" (meaning junior person). These names, distinguishing the age differences, continue for life. However, as in the family, younger ones call older ones "Sempai", although older ones call younger ones by their names when they address individuals directly. These kinds of interactions create tremendous power dynamics. If "Kohai" do not obey older people, they often get punished and bullied. "Sempai" is represented as the strong and "Kohai" is represented as the weak. Students learn these kinds of dynamics through their school activities such as sports clubs or many other art clubs. This structure creates tremendous pressure and strictness as to how to exist in a hierarchy. Hierarchy is also a significant part of Karate culture. The structure is reflected everywhere both in and outside the dojo. How the hierarchy is formed depends mainly on seniority but in western countries are we loosing track of culture we were trying to follow from the 1960’s? We learn from being a young student how to rei to show respect and the meanings of the Japanese terms, the hierarchy Shihan, Sensei, Senpai and Kohai. Shihan meaning master a title attributed normally to an 7th Dan Black Belt or Chief Instructor of an association. “Shi” means teacher or master and “Han” means an example, model or pattern. Sensei meaning teacher, “Sen” meaning ahead or precede and “Sei” meaning life. Senpai meaning senior student, “Sen” meaning precede and “Pai” means a group of people. This title is usually reserved for first and second dans. If a lower grade is teaching they should be addressed by the class as Senpai. 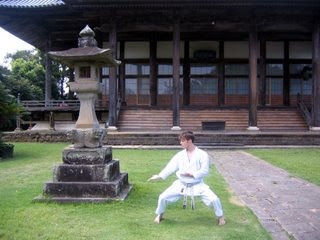 A junior dan grade may address a senior dan grade (within two grades) as Senpai; unless they are teaching then they should be referred to as Sensei. The Senpai should oversee their Sensei’s wishes as how the class should be run; they act as a go between. It is their duty to correct etiquette, manner and behaviour, to remind the class at the earliest opportunity. The practice of a Japanese martial art begins and ends with etiquette. Within the Japanese culture respect is paramount for its function, similar to a military force seniority is marked by some distinction to display rank. Also the higher the rank and the length of service gains it’s rewards and privileges. Karate is no different. From the absolute white belt to the black belt turning white there is an order. Seniors have earned their respect by dedication to their art over the years of service. In the early days of Karate in the West there were few dan grades, the majority were Shodan anything higher was unusual. All high grades came from Japan and I think it was from here that our respect came for our Japanese teachers. What Kato Shihan was saying to us is that now there are many westerners with thirty years plus experience in karate. These Karateka deserve our deepest respect far more so than a young Japanese instructor fresh from instructor school. Kato Shihan has also explained to our young Japanese instructors that there are many western fifth, sixth and seventh dans that should be treated in the same manner as a senior Japanese instructor, the colour of the skin makes no difference. In the west we sometimes forget how many years of dedicated training our own instructors have given to their art. Please give it some thought. Osu! Go no Sen & Sen no Sen, what? At the Black and Brown belt course, Kato Shihan talked about “go no sen” and “sen no sen”, terms that are mentioned in passing, but what do these terms mean? “sensen no sen,” an initiative launched in anticipation of an attack where the opponent is fully committed to his attack and thus psychologically beyond the point of no return. The latter strategy is generally considered to be the highest level in the classical martial arts scenario. In karate we consider, “Sen no Sen” is attacking by seizing the initiative and “Go no Sen” is seizing the initiative later. Nakayama Shihan spoke about “Ken” and “Tai” . Ken, meaning launching an attack seizing the initiative and Tai, not attacking suddenly, waiting for the enemy’s charge. He talks about keeping the mind in a state of reserve (tai) and the body in an active condition of (ken), often winning by letting the enemy make the first move. A bit like sensei Billy’s gyaku-zuki. 1. “tai no sen” , no motion is shown, attacking from a frontal position, tactics are primary, techniques secondary. 2. “yu no sen”, attack comes from movements changing, break the enemy's posture and outmaneuvering and attacking, techniques are primary and tactics secondary. Understanding the above can be the turning point between victory and defeat. Well thats the theory, the practice is something quite different, happy kumite! Last weekend we were at Sensei's in Whitchurch for another Black and Brown belt course. Another great course with sessions from Sensei Billy Thompson and Sensei Paul (Don't ask me how you spell your surname). I will write more on the weekend when I have a bit more time. The attendance was not brilliant and should be a lot better, please put 1st and 2nd of December in your diaries for Shihan's Christmas Course. If you have never ventured over to Whitchurch before ask your Sensei about the Christmas course, usually a little less formal with a great social atmosphere. An ideal opportunity to lift your training and meet other members of the IJKA. Saturday 10th November 2007 at Wiggington Recreation Hall, Wiggington , York. 1.30pm for 2pm to 4pm, All grades Training only. Sunday 11th November 2007 at Wiggington Recreation Hall, Wiggington, York 9.30am for 10am to 1pm. All grades training and grading. A couple of weeks ago we trained with Sensei Brennan in York, I thought I would share with you a photo of Sensei Ash with Sensei Brennan, which was taken 15 years ago in August 1992. Gullen Sensei has been trying to introduce me to Bassai Sho over the last few weeks, but it just didn't seem to be going in. Some katas I seem to pick up reasonably quickly , but Bassai Sho is not going to be one of them. I would prefer to concentrate on Basai Dia, Jion and Kanu Dai but Sensei had other ideas. The other Thursday night Sensei Mike Gude decided to do Bassai dai with the Brown belts and then went onto Bassai Sho. While if I can't beat them I thought I must try and make some sort of attempt to get my head round the kata. On Sunday I asked Sensei Andy Denby if he would take us through the kata and the sequence of moves is almost there. Nakayama Sensei stated "Bassai Sho should be practiced after mastering Bassai Dai...Bassai Dai outwardly showing power and Bassai Sho an inner strength. While if I wait until I have mastered Bassai Dai I will never start, will I? It seems a big step to Shodan, no longer am I trying to improve on previous kata and learn a new one, suddenly there are lots of kata to learn and in no particular fixed order. Thank you to all my Sensei for your patience, i'll just keep trying. Looking forward to Kato Shihan's course at the weekend.